Bootie Loves Prince @ The Regent — Memorial Day Sunday! 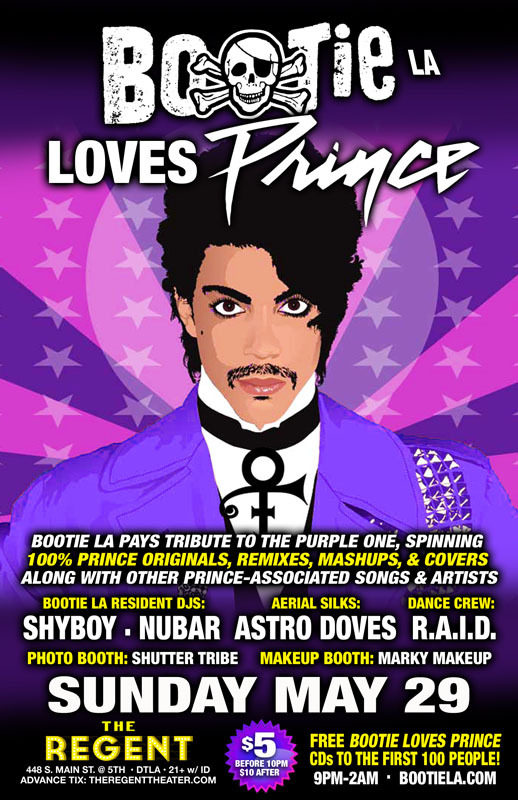 Los Angeles Bootie Loves Prince @ The Regent — Memorial Day Sunday! Bootie LA returns to the Regent Theater to pay tribute to the Purple One, spinning 100% Prince originals, remixes, mashups, & covers, along with other Prince-associated songs and artists, with special performances throughout the night! Only $5 before 10 PM! Win drink tickets by answering Prince trivia throughout the night! This year has been devastating for music lovers, and the passing of Prince was a particularly shocking loss. His raw talent, unbridled energy, and awe-inspiring live shows were unparalleled. With a genius-like skill on almost any instrument, lyrics that touched people deeply, and a personal style that not only allowed people to be themselves but encouraged it, Prince certainly was one of the most unique artists in memory. While many of us are still reeling from his loss, Bootie instead wants to celebrate the life and music of the Purple One the only way we know how: by throwing a party and playing all the best Prince originals, remixes, and mashups, along with other Prince-associated songs and artists, with special performances throughout the night! Resident DJs ShyBoy and Nubar will spin all the Prince songs you love, both obscure and his hits, along with Prince tracks mashed up and remixed. Plus, they’ll be throwing in songs he wrote and produced for other artists, some which may be surprising! There will be special Prince performances through the night, including ShyBoy singing a live Prince number, Astro Doves performing on the aerial silks, and resident dance crew R.A.I.D. giving you purple go-go insanity. Plus, you can win drink tickets by answering random Prince trivia! Marky Makeup will help glam you up in the Prince Makeup Booth, and club photographers Shutter Tribe will be there capture it all. Plus, there are FREE “Bootie Loves Prince” CDs for the first 100 people!